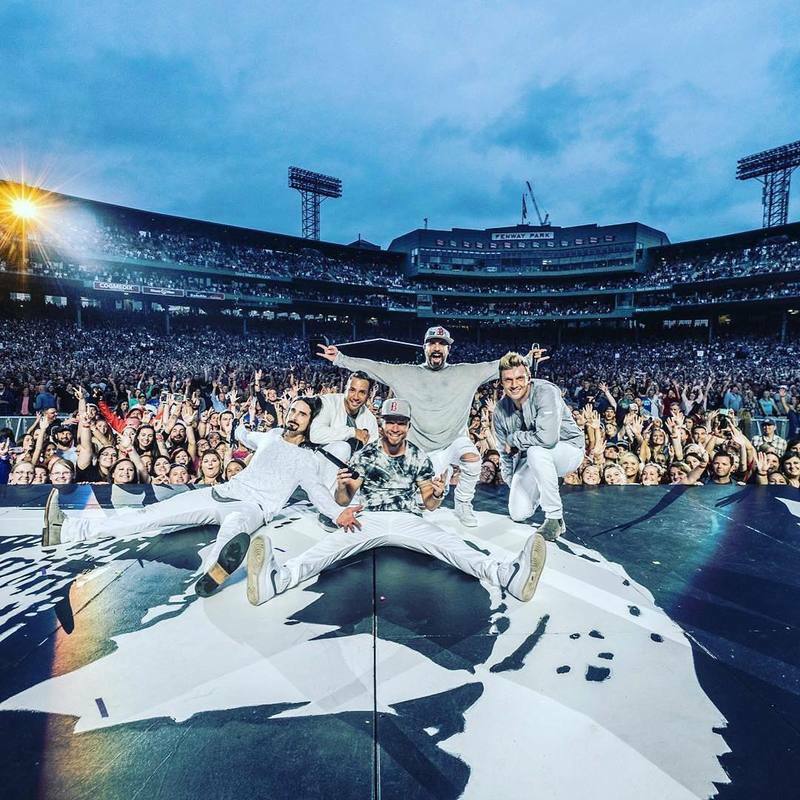 You are here: News / The Backstreet Boys Take Fenway And Quebec - In One Weekend! The Backstreet Boys Take Fenway And Quebec - In One Weekend! It was a weekend of new adventures for the Backstreet Boys that turned out to be overwhelmingly successful experiences! The Boys packed up their West coast wardrobe on Friday and headed to Boston for the first of three shows with Florida Georgia Line, Nelly and Chris Lane on the Smooth stadium tour. For Nick, Brian, AJ and Howie, it was the 2nd time playing to a sold out crowd at the Green Monster, as Fenway Park is affectionately known, but they’ve made it clear that they want to be back again soon. “We want to play Fenway by ourselves. Can you make that happen?” Nick Carter asked the crowd at Boston’s Mix 104.1 Mix Lounge on Friday before the show, with the crowd answering in the affirmative. The Mix crowd was then treated to a few acoustic versions of BSB classics and a promise that the Boys would be back on their world tour next year. If you were one of the lucky winners to meet the Backstreet Boys on Friday, you can find your photos here. The rainy day in Massachusetts did not keep fans from showing up to party with the Smooth tour gang in what would be a high octane onstage party from beginning to end. After BSB’s half hour set, they came back out of the stage to sing their first country music collaboration with FGL, “God, Your Mama, and Me”. Both groups were surprised with the presentation of a plaque that celebrated the single going #1 on country music radio in recent weeks, which leaves us wondering – is there anything these guys can’t do? As if playing Fenway twice in a lifetime wasn’t enough to brag about, Kevin, Brian, AJ, Howie, and Nick have another career milestone to put on their list – playing for nearly 100,000 people at FESTIVAL D’ÉTÉ DE QUÉBEC in Quebec City on Sunday night. After AJ proclaimed that the crowd may have been the largest they’ve ever played for, the Boys proceeded to close out the summer festival in the best way, with fans singing (and screaming) along the whole time. Showbizz.net wrote that “magic was not a strong enough word to describe the performance”. It’s no secret that Canada has always had a soft spot for the Backstreet Boys and they definitely proved last night that 24 years hasn’t changed anything. Check out photos from the performance here and a video that is sure to make you emotional below. The Backstreet Boys will be back on the Smooth tour at the end of the month in Minneapolis – get your tickets now! In the meantime, don’t forget to tune in and watch Nick help create America’s next boyband on Boy Band, which starts live shows on Thursday at 8/7c.